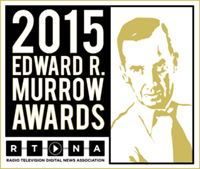 RTDNA Announces Winners of the 2015 National Edward R. Murrow Awards | Broadcast Public Service: Local Stations. Big Impact. The Radio Television Digital News Association (RTDNA) announced the 2015 National Edward R. Murrow Award winners, recognizing outstanding radio, television and online news organizations. RTDNA selected 104 winners from 4,200 entries. RTDNA also announced the 2015 Kaleidoscope Award winners for excellent coverage of race, ethnicity, sexual orientation and gender identity. Winners include the University of Washington’s KUOW-FM Seattle (large market radio) for "Two Indias: Near and Far" and General Communication’s CBS affiliate KTVA-TV Anchorage, AK (small market television) for "Season of Sacrifice, Season of Hope."